This update adds functions optimized for the shooting environment and makes changes to the specifications. As a result, some changes have been made to camera operation methods and other items. Check the main changes noted below before executing the update. Camera functions have been added and deleted, so the configuration of the setting items displayed when the MENU button is pressed has been changed accordingly. We recommend you check the MENU configuration prior to shooting. For the setting item details, click here. Functions optimized for the shooting environment have been added. Accordingly, the function names and operation methods have been changed. In addition, some functions have been deleted. Be sure to check the change content details prior to installing the update. For the changes to functions made by this update, click here and scroll to the Changes to functions made by this update section of the page. Buy the Sony a9 at B&H, Adorama and Amazon US. Resolves an issue where, in rare cases, a SEL1635GM lens is not properly initialized when used with an ILCE-7M3 (a7 III) or ILCE-7RM3 (a7R III) camera. SAN DIEGO, Jan. 15, 2019 -- Sony Electronics Inc. today announced a major upgrade to its a9 mirrorless camera that will be available via a firmware update. Sony's revolutionary a9 camera will receive several major enhancements to its award-winning autofocus (AF) performance and image quality, as well as receive a variety of new features that are designed to improve the overall workflow for professional photographers. In addition, new firmware updates for a7R III and a7 III will be available that update these cameras with the latest enhancements including Real-time Eye AF performance and add interval recording capacities. The upcoming firmware version 5.0 for a9 adds Sony's newly developed Real-time Tracking mode for object tracking. This mode utilizes Sony's latest algorithm—including Artificial Intelligence-based object recognition—and processes color, subject distance (depth), pattern (brightness) as well as spatial (distance) information to ensure that all subjects can be captured with extreme accuracy and precision. When photographing or videographing humans or animals, face and eye position information is recognized by AI and the subject's eyei is monitored in real time with extremely high tracking precision. In addition, "Tracking On" helps initiate real-time tracking at any time by simply pressing a custom-assigned buttonii and "Touch Tracking," which quickly activates through the touch screenii. With this new firmware version 5.0, Sony's acclaimed a9 camera will receive advanced "Real-time Eye AF," the latest version of Sony's acclaimed Eye AF technology. This exciting new capability employs AI-based object recognition to detect and process eye location data in real time, resulting in improved accuracy, speed and tracking performance of Eye AF. In all autofocus modes, the camera can automatically detect the eyes of the subject and activate Eye AF with a half press of the shutter button, and the camera will seamlessly track the eyes at all times when in AF-C mode. The new firmware will also enable photographers to select the preferred eye (left or right) of their subject as the focus point. In addition to the several new capabilities, the firmware also adds compatibility with Sony's new Imaging Edge Mobileiii application - the successor to the PlayMemories Mobile application. The new Imaging Edge Mobile application features a 'Transfer & Tagging add-on'iv function to assist professional workflow. This allows photographers to transfer images from their camera to their smartphone during capture using the FTP transfer functionalityv, and adds support for including IPTC metadatavi on transferred images. Version 6.0 firmware for the a9 camera will add Eye AF for animal eyesi, an exciting new feature for wildlife photographers that will enable interval shooting functionality for creating time-lapse moviesvii. Sony's popular a7R III and a7 III full-frame cameras will both receive enhanced Real-time Eye AF performance with the upcoming firmware version 3.0. This will be available in AF-C mode with a simple half-press of the shutter button. Real-Time Eye AF for animalsi will also be available. [Note 1] When updating to this version from a lower version than "Ver. 4.00", the FTP transfer feature and Wired LAN settings are initialised. You will have to configure these two items again. The names of FTP server 1, FTP server 2, and FTP server 3 will be kept, but other items will be initialised. If you have set the Wired LAN Settings to Manual, each of the manually configured settings will be initialised and the Wired LAN Settings will be set to Auto. 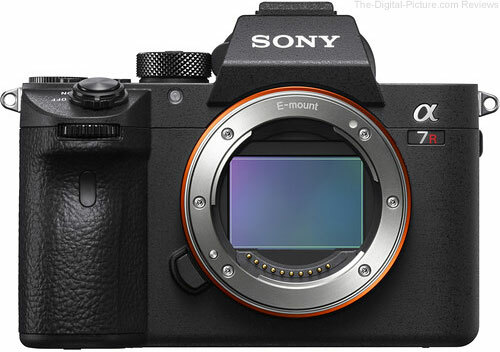 Sony has just released new firmwares for its a7R III and a7 III MILCs. See below for details. When updating to this version, the FTP transfer feature and Wired LAN settings are initialized. You will have to configure the two items again. The names of FTP server 1, FTP server 2, and FTP server 3 will be kept, but other items will be initialized. If you have set Wired LAN Setting to Manual, each of the manually configured settings will be initialized and the Wired LAN Setting will reset to Auto. When the camera is updated from Ver. 3.00 to this version, the registered settings for Fn (function) menu may not be kept.In that event, please customize the menu to your preferred settings again: Setting: [MENU]-[Camera Settings2]-[Function Menu Set.]. Refer to the HelpGuide for more information on how to update functions. Note: For cameras updating from version 3.00 to 3.01, the registered settings for the Fn (function) menu may not be inherited. You may need to customize the menu to your preferred settings again. Note: With the SEL400F28GM lens, focus will not be locked even during continuous shooting at F-values greater than F11 under the following conditions: AF-C, electronic shutter, and the Aperture Drive in AF menu set to Focus Priority. Continuous shooting speed might be slow when the F number is over F11. Want to know more about the Sony a9? Check out our full review here. *2: Need to create IPTC information beforehand by using the "IPTC Metadata Preset" software. B&H carries the Sony a9 Mirrorless Digital Camera. B&H carries the Sony a7R III Mirrorless Camera. 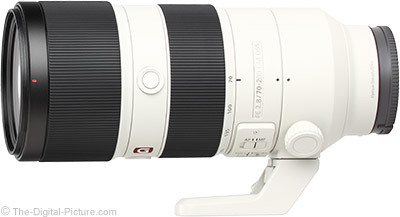 Sony recently released a firmware update for its FE 70-200mm f/2.8 GM OSS lens. See below for details. Sony has just released a slew of firmware updates for its Alpha series mirrorless cameras, including a fix for the a9's premature overheating warning. Details are below. 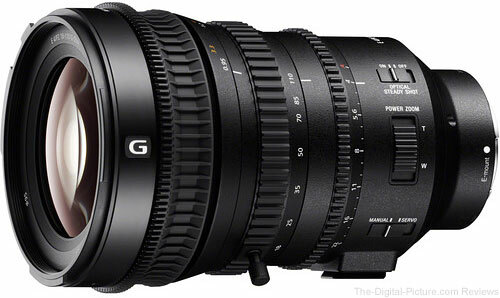 B&H carries the Sony Alpha series of cameras.